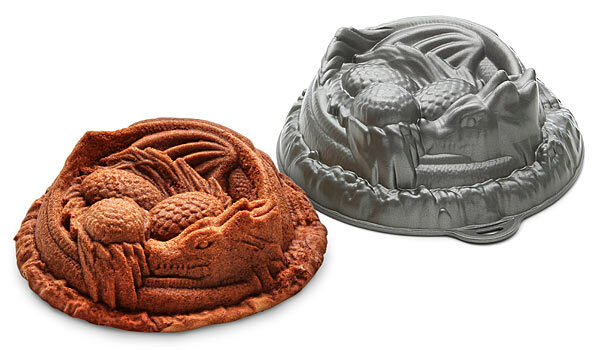 Dragon Cake Pan Must Be Ours | OhGizmo! By David Ponce on 05/04/15 • Leave a comment! With Game of Thrones in full swing, everyone’s thinking of dragons. At least we are, especially when they look as delicious as the cake that comes out of the Dragon Cake Pan pictured above. I mean, if you’re going to go through the trouble of baking a cake, why not make it something to remember? Layers are good, dragons are better. The thing has a 10 1/2″ diameter and is 4″ tall, so that’s a decent sized cake. It’s $24, but could cost twice as much and we’d still consider purchasing it. It’s currently backordered, but Thinkgeek is quoting a 1-3 lead time.